How does the Inverse-Square Law play a role in image making? Although most artists use a pattern of light and shade when creating the illusion of three-dimensions, there can be more to the art of portraying this illusion than simply reproducing such a pattern. To give an insight into the complex issues involved, the following discussion focuses on the subtleties and difficulties inherent in applying the Inverse-Square Law with reference to one of Nicolaes Berchem's (1620–83) etchings. First let me offer a brief explanation of the Inverse-Square Law. This law, with its ancestry arguably stretching back to Newton’s exploration of the relationship between gravity and distance, proposes that there is a correlation between the degree of illumination on a subject and the distance that the subject is away from the light source. The rule is that the degree of illumination decreases at the following ratio: the distance that a subject is away from the light source squared. For example, if one evening a light were to be placed in a yard full of dogs, a dog that was one metre away from the light would be four times more brightly lit than a dog that was two metres further away. The video below graphically illustrates the maths involved even if the focus is on the art of buttering bread. Undoubtedly, the Inverse-Square Law offers a useful mathematical base upon which artists can determine the precise degree of illumination cast on a subject. But for artistic expression the law is usually more of a broad guide rather than a strict rule for pictorial representation. After all, very few artists would wish to engage in careful measurement and calculation that is necessary to follow this scientific rule. Moreover, equally few viewers’ eyes would be so attuned to see exact differences of illumination even if a highly disciplined artist ensured that the law was obeyed with absolute precision. For instance, viewers are very unlikely to see precise changes of illumination in daylight separating every dog in a yard. But this does not mean that most viewers would not be sensitive enough to recognise broad changes in lighting differentiating the position of one dog from the next. For example, consider how Berchem has altered the degree of tonal contrast to differentiate each of the three dogs shown in the etching below (i.e. the standing dog is rendered with the strongest contrast while the foreground dog shows slightly more contrast than the dog further away). Condition: strong impression on thin laid paper with 2.8 cm chain lines. The sheet is cut close to the plate mark as was once the custom. There is a faint trace of a pencil line on the bottom left and a brown mark towards the upper right. 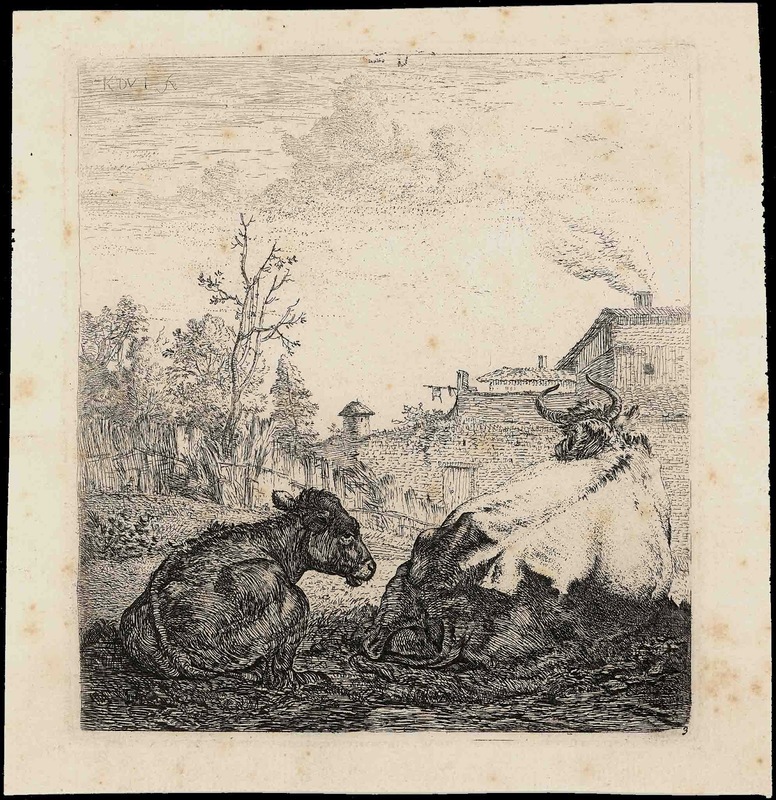 The print is not laid down and is in a remarkable condition considering its age. I am selling this print for $85 AUD including postage and handling to anywhere in the world. Please contact me using the email link at the top of the page if you are interested or click the “Buy Now” button. 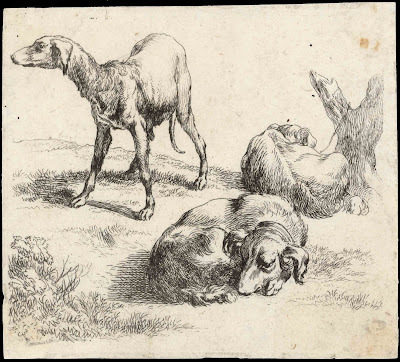 Despite Berchem’s differentiation of the dogs by tonal contrast, there is a problem with the position of the dogs in terms of their hierarchy of tonal contrast relative to their distance from the light. In short, the dog in the foreground should have been rendered with the sharpest contrast as it is arguably the closest to the light and the standing dog should have been rendered with the softest contrast because it is the furthest away from the light (see exaggerated reconstruction of the placement of tonal contrasts below). An artist can draw upon other principles when applying the law to give more subtlety to the rendering of tonal contrasts. One of these principles is the “lighting ratio” that photographers consider if the lighting of their subject is too harsh. This ratio involves making adjustments to the lighting so that the main source of light (the “key”) is balanced by other scattered light (the “fill”) to allow details in any cast shadows to be visible. 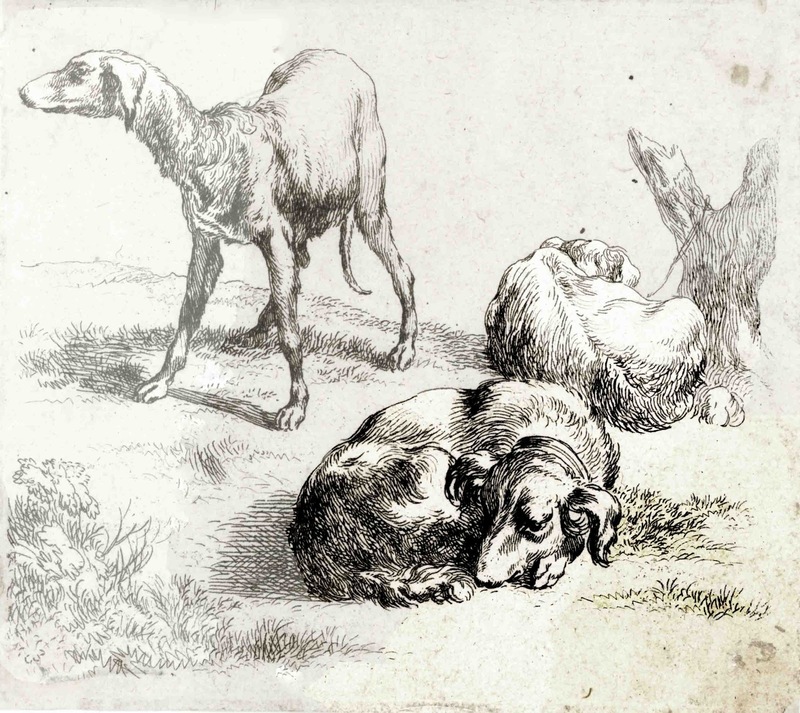 In Berchem’s rendering of the three dogs, the knowledge of how to adjust the lighting ratio to depict the effects of light reflected on hair is one of the fundamentals of portraying form: superficial details are not shown in those areas of brightest light or in areas of darkest shadow but are restricted to those areas in half light. 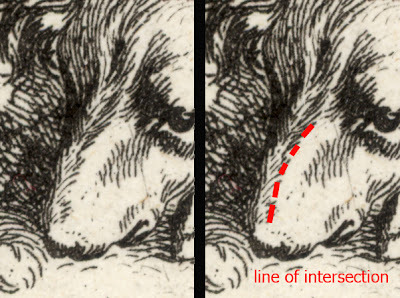 For example, the pattern of light and shade on the foreground hound’s snout shows a line of demarcation separating the lights and darks (see detail below). The accentuation of tonal contrast along this line helps to signify that the dog is in strong light. 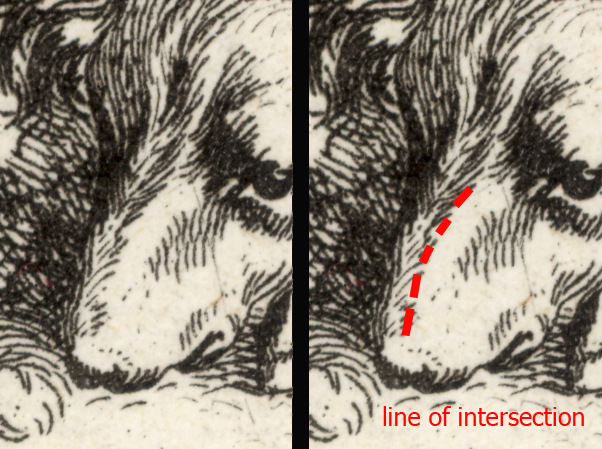 To ensure that details of hair on the snout are not lost in portraying the effect of strong light, these details are shown in the half light (i.e. the shadow areas abutting the line of demarcation but before areas of the darkest shadow). There is another principle extending upon the last to show changes in the pattern of light and shade over a form: varying the tonal contrast along the demarcation line itself so that the contrast is strongest where the angle of light directly illuminates a form. Berchem’s approach to portraying form falls short of employing this principle but his contemporary, Karel Dujardin (c.1622–78)—discussed in an earlier post—is a perfect example of an artist who applies it. 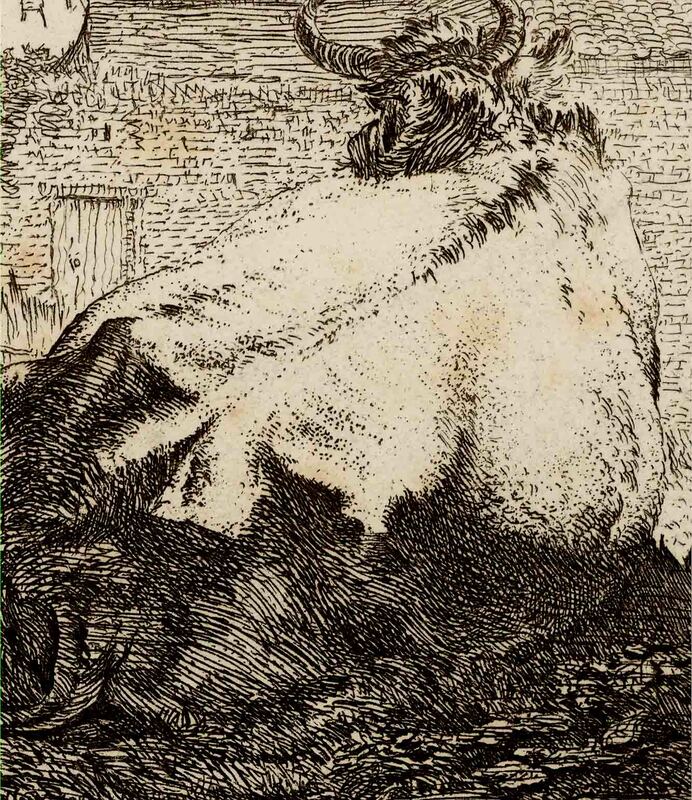 In Dujardin’s Cow and Calf (see image below), for instance, take note of how the line of demarcation on the cow is beautifully phrased with strong contrast where the light hits directly upon the hip bone and then softens in contrast as the light tangentially brushes on the cow’s belly. Condition: very good impression on laid paper with 3 cm chainlines. There is scattered faint foxing otherwise in a clean condition. The print is not laid down. I am selling this print for $145 AUD including postage and handling to anywhere in the world. Please contact me using the email link at the top of the page if you are interested or click the “Buy Now” button.